An engaged board is an effective board, and an effective board is a requirement if your organization is going to meet the goals it set forth in your strategic plan. It sounds simple, but organizations often struggle to get their directors engaged and excited about the work of the board and the organization those directors lead. Here are a few best practices you can follow to improve engagement on your board of directors. 1. Conduct a board orientation for your directors. It’s hard to be engaged when you don’t know exactly what it is you’re supposed to do. That’s true for any role in any organization, including a board of directors. Fortunately, there is an easy fix that will help new directors start off on the right foot—and in the long run increase engagement throughout your board. When a new director joins the board, schedule a new director orientation as soon as possible. Review your organization’s strategic plan, current board priorities, frequency of meetings, attendance policies, and whether board members can expect to receive meeting material in printed form or have access to paperless meeting materials. A simple thing like an orientation might not seem like an important step in maximizing engagement with your board of directors, but it is. In any role—including serving as a director on a volunteer board—it’s hard to be engaged when expectations are unclear. 2. Give your board members meaningful roles. Directors don’t volunteer for a board to get an intimate understanding of Robert’s Rules of Order. Directors volunteer for a board because they support the mission of the organization. Directors volunteer for a board because they believe they can make a difference. Directors volunteer for a board because they want the opportunity to be leaders in their community. Give your directors a chance to utilize their leadership skills and their passion for your organization. Identify opportunities for individual directors to lead strategic initiatives and important projects. Additionally, make sure your organization has written job descriptions for officers and directors. Like the orientation, job descriptions help members of a board of directors understand exactly how they will contribute to your organization. 3. Make serving on a board of directors easy. Directors at mission-oriented organizations like nonprofits, school districts, cooperatives, trade associations, and community banks are almost always volunteers. They have lives, careers, and responsibilities they must balance alongside the time they dedicate to your organization. If serving on your board of directors becomes a logistical hassle, engagement will suffer, and attendance at board meetings may become spotty. In the long run, your organization will suffer as your directors become frustrated by inconvenience. 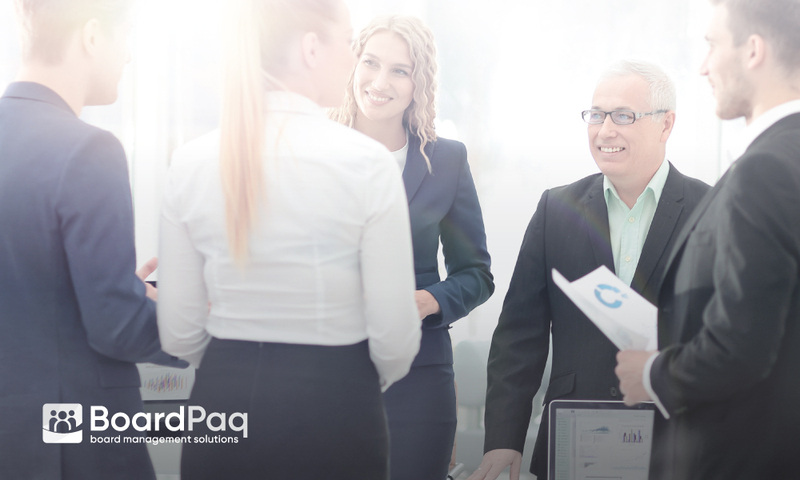 That’s why BoardPaq has designed a board portal that makes service on your board of directors as easy and convenient as possible. · News and announcements that help keep directors aware of information they need to know. · A home screen that allows directors to complete assignments from prior meetings as well as review and comment on draft minutes. · A meeting calendar that gives easy access to upcoming meetings as well as past meeting materials. · An online agenda for meetings that gives users the ability to view documents and add notes to agenda items. · One-button download that gives users access to the most up-to-date content and lets users download all available meeting documents with just one touch. · Secure, real-time discussion that enables collaboration between members and staff on individual agenda items. · The ability to participate in discussions on any meeting agenda item and see what others are saying about various important topics on the agenda. Those are just a few of the tools found in our Board Apps that make serving on a board of directors easier and more convenient than ever before.